Measure of America has developed a new analysis for Opportunity Nation that explores the relationship between civic engagement and opportunity. 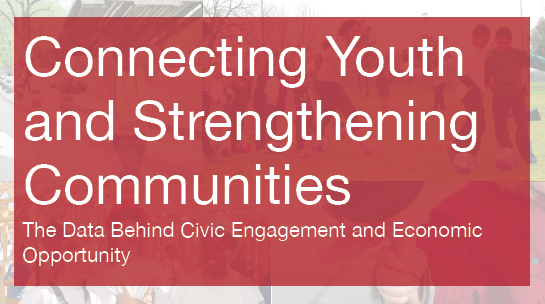 Supported by the Citi Foundation, the report, “Connecting Youth and Strengthening Communities: The Data Behind Civic Engagement and Economic Opportunity,” provides data and analysis that builds on previous studies that found associations between civic engagement and economic opportunity. The report found that civic engagement may help youth, particularly low-income teens and young adults ages 16-24, build social capital and skills that can help them find meaningful education and career pathways. Further, two forms of civic engagement in particular—volunteering and membership in a civic or service organization—are significant predictors of economic opportunity across states. Youth who volunteer are considerably less likely than their non-volunteering peers to be disconnected from work and school. 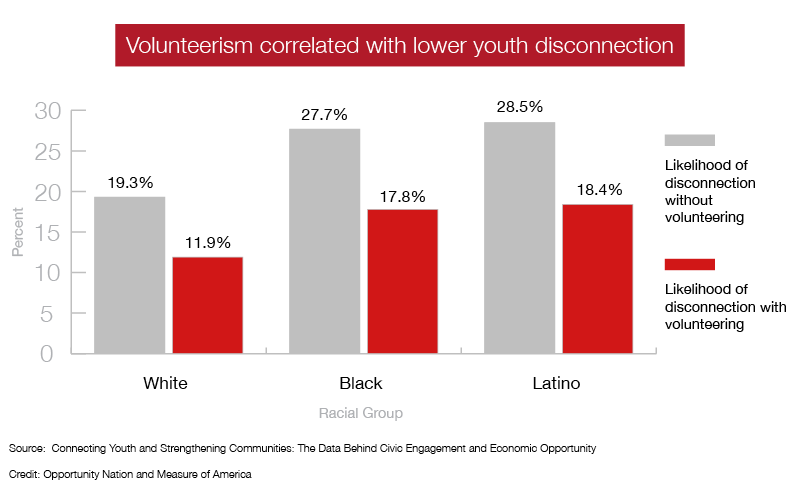 In fact, the likelihood that a young person is disconnected drops nearly in half if he or she volunteers. Civic engagement—specifically volunteering and participation in a civic or service organization—is a significant predictor of economic opportunity across states. Volunteerism has an inverse relationship with income inequality. In places with higher rates of volunteerism, income inequality tends to be lower. Intuitively, we know that joining an organization, attending a public meeting or donating time or money to a charitable cause can all contribute to the social good. But there is a growing body of research that highlights additional benefits for individuals and society.